A couple of months ago I featured the import story of Diamond, a molly mule brought over from the USA to her new home in England. In it, Sheril cited her friend, Donna, as one of the many wonderful people who had helped in her endeavor. 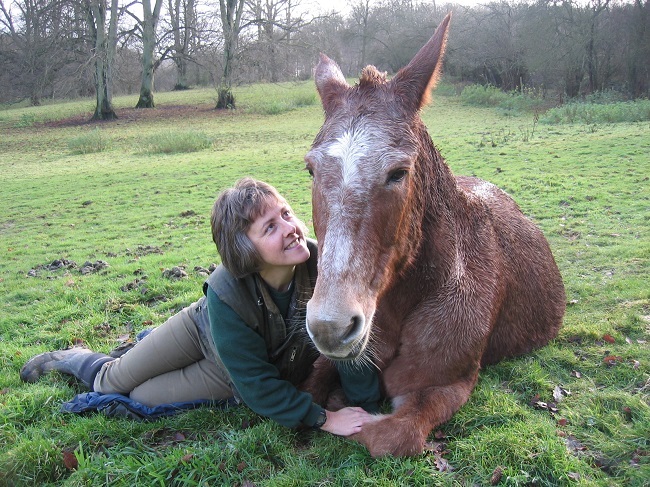 Donna had first-hand experience because she herself had fallen in love with an American mule and brought her home to the UK! Sheril very kindly put me in touch with Donna, who agreed to let me share her fantastic story here. This is a reprint of a 2003 Mules And More article which Donna wrote for the magazine; it is illustrated with photos from their time together in England. Sweetheart sadly passed away in 2007, but I think it is clear to see that she was one spectacular mule. All images in this article are © copyright Donna Taylor. I will take you back to September 2000 when I went on my annual horse riding holiday. I had chosen a company called the Red Rock Ride (RRR). Three to four times a year they take around thirty people riding and camping through the stunning scenery of the Grand Canyon, Bryce Canyon and Zion National Park. The RRR is run by two families. Pete and Keela Mangum and Robert and Daylean Houston. The Mangums own all the horses and mules, and the Houstons take care of the catering. As I was to find out, together they are a fantastic team and make this sort of holiday an experience to remember. Other family members also work on the ride, either as wranglers, chefs or domestic help. Day one of the week’s ride started at Zion National Park. Pete Mangum asked the group if anyone would like to ride a mule instead of a horse. Well, I had never really thought about riding a mule before, but decided to have a go. I would always be able to change my mind the next day. 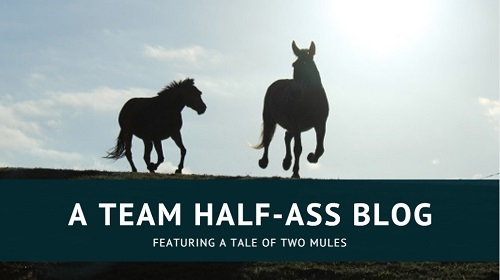 I think I shared most people’s perspective that mules are stubborn and prone to kick! Pete then put each rider with a mule or horse. He said, “Donna, I think I will put you on Sweetheart”. One of the wranglers introduced me to her and I think I could say that it was love at first sight! There was something special about Sweetheart that I liked, even though she looked no different from the other mules. That week was wonderful. I met some great people who are now my very dear friends. And I think that Sweetheart and I bonded really well. She was quiet and gentle with a lovely nature. When I got home after that holiday, I couldn’t stop talking about my experiences with Sweetheart on the RRR. The following September, I decided to go back on the RRR. I emailed Pete and Keela and asked them if I could ride Sweetheart again. There was no hesitation with their reply – they knew how much I enjoyed riding her. So back I went and I rode her for the week. She was exactly the same, quiet and gentle. However, as the week was drawing to a close, I felt a tinge of sadness come over me – I wanted to bring her home. Now, I have had horses since I was eight years old. I used to do a lot of showjumping. I also bought a young thoroughbred and broke her in. Since I sold her about fifteen years ago, I haven’t owned another horse. At the end of the week, I approached Pete and asked him if I could buy Sweetheart. I will always remember what he said. “Donna, she is not for sale – she is a good Grand Canyon mule and I want to keep her”. Although I was disappointed, I was not surprised by his reply. Sweetheart is a 25 year old sorrel, around 14.2hh. When not on the RRR, she has spent the last six years taking tourists from the north rim down into the Grand Canyon. Only mules are allowed into the canyon because they are so surefooted and sturdy. These daily tourist trips are another large part of the Mangum’s business. Although I came home after that ride feeling a little subdued, I had enjoyed myself very much again. In 2003 I knew exactly where I was going for my annual riding holiday. By this time I had built up a very strong friendship with the Houstons and Mangums. When I told them I was coming back for my third RRR, they instantly knew who I wanted to ride. As well as the new faces, there were quite a few friends whom I had met on the previous rides. We all had a great time, and of course I met up with Sweetheart again. I told a few of the wranglers that Pete wouldn’t sell her to me last year, and they said to ask him again. I also had my RRR friends encouraging me to do so. I sat there waiting for a “No”. However, to my surprise, Pete said, “OK, you can buy her, but on one condition. 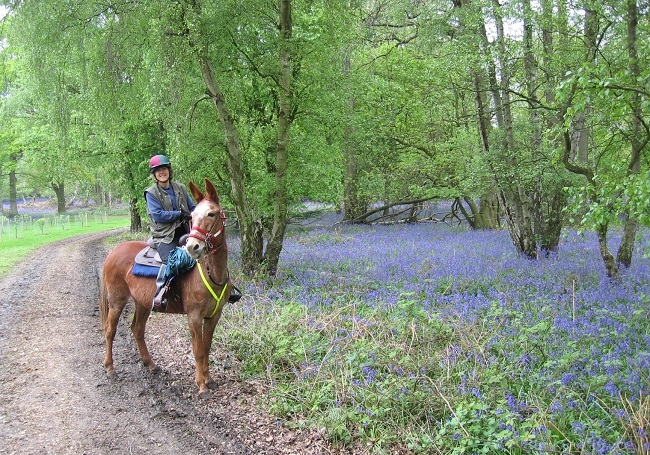 You make sure that she is in a field with other horses – mules don’t like to be on their own”. We then agreed a price, and that was that, apart from the small problem of transporting her back to England. I told Pete I would look into all the travel arrangements and get back to him. On the flight home I was filled with happiness and anxiety. I firstly had to break the news to my husband, Colin. His response was similar to that of several friends. “You live in the UK. Sweetheart lives in United States. It’s going to cost you a lot of money. 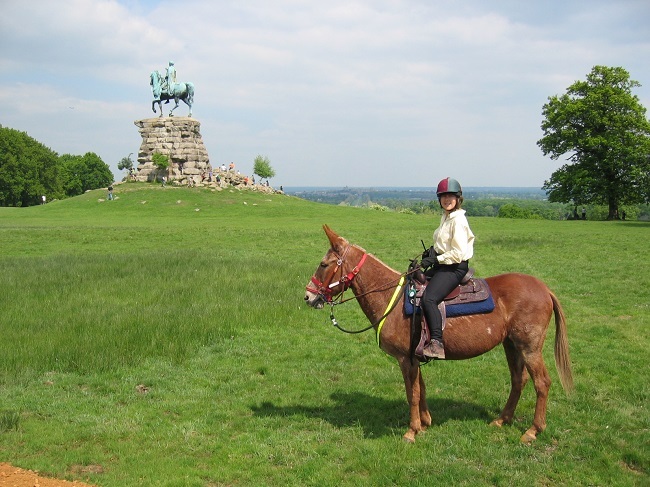 Why don’t you buy a horse in the UK?” I ignored him and quietly started to research ways of getting her home. I have been a member of the British Mule Society for several years. This was my first port of call as I began my research. Eventually, after many telephone calls and emails, I established that Sweetheart’s journey would be something like this. Firstly, she would have to be quarantined in the United States for 30 days, and for this I was recommended to a company called Nedpoint, based in Oklahoma. This meant that before the quarantine period, I would have to transport her from the Mangum’s ranch in Utah to Oklahoma, a distance of around 850 miles. After quarantine, she would travel to Houston in Texas to be loaded onto a Boeing 747 designed to carry horses and mules as well as passengers. This plane would take her direct to Amsterdam and I would then use a company called John Parker International Horse Transport to complete the final leg of the journey to Sweetheart’s new home in England. By the time I had found all this out, it was still winter time in the UK. I didn’t want to bring Sweetheart over here when it was cold, wet and dark early in the evenings. Pete rests all his horses and mules through the winter and I felt it would be nice for Sweetheart to have that time there. Because of this, I planned the journey for the Spring. As we do not have any land of our own, I had one more arrangement to make. I had to find a new home for Sweetheart. I ride with a friend of mine, Miranda. She owns two horses which she keeps on around ten acres of land next to her house. When I discussed my plans with her, she kindly offered to let Sweetheart move in with her two horses. I was really pleased. I knew that she could live out all year round, with plenty of shelter in the fields and nice countryside to ride in. And it is only six miles from my home. On 14th March 2003 I flew to Utah to stay with Pete and Keela. Pete was still amazed that I was flying her home. 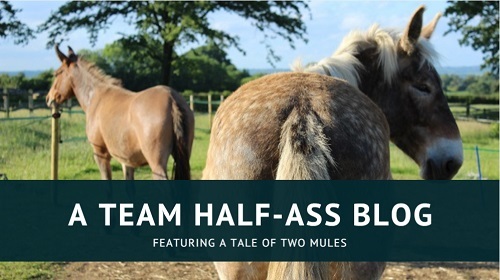 Whilst there, Pete helped me to understand mules a little better. We also arranged health checks and injections for Sweetheart, and completed the necessary paperwork for her sale. On Tuesday 18th March, I helped Pete’s son Tawn to load Sweetheart into the horsebox for the first part of the journey – a five hour drive to Flagstaff, Arizona. We then transferred her to a horsebox belonging to a transport company for the longer journey to Oklahoma. I then returned with Tawn to the Mangum’s ranch. Two days later I left Pete and Keela and flew to Oklahoma to meet up with Sweetheart. I was met at the airport by a Dutch lady called Irmgard who runs Nedpoint. From the moment I arrived, I was very impressed by the facilities. Irmgard has around fifty stallions belonging to various clients, and she either uses them for breeding, or shows them in competition. She also has brood mares, yearlings and the quarantine horses. People bring their horses to Nedpoint from all over the United States and Europe for training. 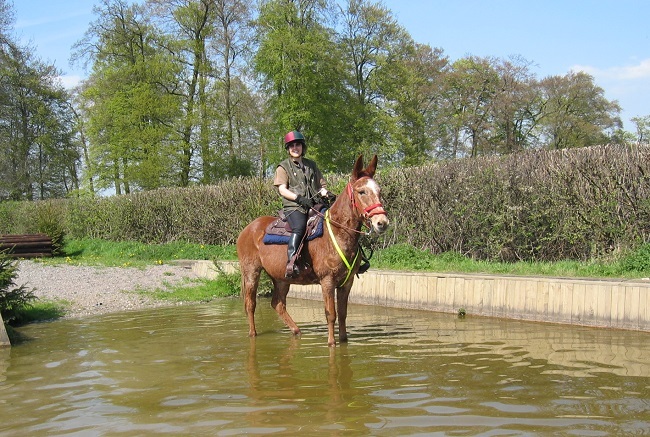 A recent addition to the facilities is an aqua treadmill that is used for exercising horses. When I saw Sweetheart in the field, her eyes looked so big and her long ears pricked up. She had never experienced anything like this before and I think she was totally mesmerised. Irmgard told me that this was the first time they had ever had a mule at Nedpoint. By the time Sweetheart left, everyone had become quite fond of her. During the two days I spent at Nedpoint, I spent most of my time watching the trainers breaking in the stallions. I also watched one of the horses on the treadmill. It was an incredible experience to see so many beautiful and well behaved stallions. Whilst at Nedpoint, Irmgard went through the procedure in taking Sweetheart from Oklahoma to Amsterdam. She also asked me if I would like to be a groom on the flight. This would involve flying to Houston, Texas and meeting up with the shipping agent. My responsibilities would then be caring for the horses and feeding and watering them whilst on the plane. I told Irmgard that although it would be a great experience, I would prefer to leave it up to the experienced grooms. She asked me to think about it and let her know if I changed my mind. So on the flight home from Oklahoma, I considered the idea. It would be a great experience to fly back with horses, but an even better one to accompany Sweetheart. Then I realised that if I did fly back with her, then I would be able to travel with her in the horsebox from Amsterdam to her new home in England. When I returned home to England, I emailed Irmgard every week to check up on Sweetheart. And it didn’t take me long to decide that I wanted to fly across the Atlantic with her as a groom. So on Tuesday 6th May 2003, I flew to Houston, Texas. I arrived in the afternoon and met up with Mikki, the shipping agent. She arranges all Nedpoint’s paperwork to allow the horses to fly out of the United States. We had dinner together and she explained what my role would be on the plane. The next day, she picked me up and we went to the Animal Hotel just outside the airport at around 11.00 in the morning. There were twelve horses that were going to fly back to Amsterdam with Sweetheart, and all these animals had to spend five hours in quarantine at the Animal Hotel before being loaded into the airline crates for the flight at 16.00. That gave me plenty of time to take some video and photos. I hadn’t seen Sweetheart for about five weeks, so I was really pleased to meet up with her again. As soon as I got to the hotel, I recognised Sweetheart immediately – those long ears were sticking up above all the other horses and she looked great. However, I think by this time, she must have been wondering what was going on. This time of the year, Pete would have all his horses and mules ready for the Canyons, so I think Sweetheart knew that this year something was different. At around midday, we loaded the horses back into their horseboxes and headed to the KLM cargo warehouse where they would be loaded into their crates. Each one holds three horses, and has a space at the front for haynets and water. There is also just enough room for someone to stand in the crate with them. I was warned that the worst part of the whole journey would be loading the horses into the crates because the whole operation takes place right next to one of the main aircraft taxiways. The noise from the planes was deafening and I started to feel pretty nervous about getting these horses into the crates. Luckily this was not my job and I just watched the horse attendants. By this time Sweetheart was looking pretty worried and nervous herself. Just as they took her out of the horsebox, a large plane taxied alongside her. I was praying that she would load into the crate without a fuss. Luckily the other two horses in her crate had already been loaded and she walked straight in. Once all 13 animals were loaded, the crates were placed in the KLM cargo warehouse where it was a little cooler and quieter. Mikki then took me to the main terminal to check in. I was relieved that the worst part was over, but was wondering what to expect when we started our flight. Before all the passengers boarded, I was called to the plane in my capacity as a groom as the horses were being loaded. The plane is a standard Boeing 747, but passengers only occupy the front two-thirds. The back part of the plane is fitted our for cargo and animals. There were four horse attendants: two KLM horse attendants, a regular groom and myself, the novice. The horses are never sedated unless they become restless and a possible danger to the other horses or passengers. We had to stand with the horses when the plane took off. This felt really weird, as I had obviously never stood up before during take off. It was also very strange having two big horses and one mule in front of me. Luckily Sweetheart was in between the two horses in her crate and they all remained very calm throughout the flight. Although Sweetheart looked very nervous, she was very quiet. Once they were all settled, I left them to sleep for several hours whilst I tried to sleep myself. Unfortunately, adrenaline and anxiety kept me awake. Once, when I came back from checking the animals, I had hay all over my jumper. This mystified some of the other passengers who asked me what was going on at the back of the plane. They were astonished when they learnt that they had twelve horses and one mule as fellow passengers. When we hit turbulence, everyone else had to put on their safety belts whilst we grooms got straight out of our seats and went to stay with the horses. We were also with the animals when we landed at 07.30 am after a nine hour flight. This whole experience was one that I will never forget. On leaving the plane, we went to the quarantine warehouse where the five crates were already waiting. The animals were not allowed to leave the crates until about an hour later when the vet arrived to inspect them and check identity papers. Once Sweetheart had been checked, the driver from John Parker International Horse Transport helped me load her into his horsebox. We still had to wait a further two hours whilst all the paperwork was checked again. Eventually we set off, picked up two other horses in Holland, and arrived in Calais at around 21:00 to catch the ferry to England. 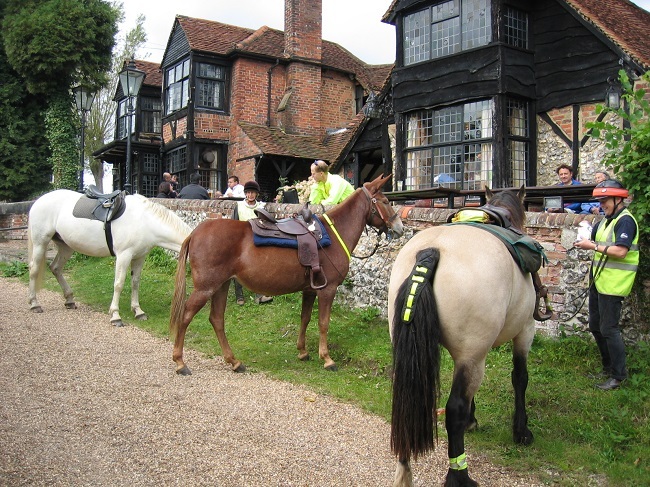 After the crossing, we drove for around half-an-hour to John Parker’s stable yard in Kent. We unloaded the horses and put them in a stable to rest for the night. Sweetheart looked tired and as soon as she got in the stable she had a long drink, then rolled and started munching on some hay. The following morning – Friday, I got up and checked on Sweetheart. She was alert and waiting for her breakfast. Afterwards, we loaded her into the horsebox again and headed off towards our final destination in Buckinghamshire. The journey finally came to an end at around midday when Miranda’s farm. We lowered the ramp of the horsebox so that she could have a look at her new surroundings. For a minute or so I stood with her whilst she just looked around. After this very long journey, I felt elated that she had arrived safe and well and with me. I put her straight in a stable and her head didn’t look over the stable door for the rest of that day. Like me, she must have been jet-lagged but also bewildered as to where she was. However, she still managed to munch her way through some hay! The next morning – Saturday, we decided to put her out in her own field, next to Miranda’s other horses. As soon as they saw her, they came galloping over to welcome their new friend. Once all the greetings had taken place, I opened the gate to her new field and let her off. She bucked, cantered and then started investigating her new surroundings. The other horses watched over the fence for hours until they all settled down and she started eating the grass. After a month, we decided to put Sweetheart in the field with the other horses. By this time they were all getting along well and they all enjoyed her company. Now, three months on, she is very settled. I see her everyday and ride her regularly. She loves her new surroundings and really enjoys riding out into the woods and open fields with the other horses. I never regret for one minute the journey and the expense in bringing Sweetheart here. She is a wonderful mule and a very big part of my life. Although Sweetheart is now in England, I am still planning to go on the RRR again this year. This time, I have strict instructions from Colin not to fall in love with another mule!! If you would like your mule to be featured here, or if you have a mule story that you would like to tell, then please contact me either via this blog, message me on my MulographyFacebook page, or email me at: herecirm (at) gmail.com. I would particularly like to hear from UK mule owners (purely because Mulography is about owning a mule in the UK), but am more than happy to take worldwide submissions!